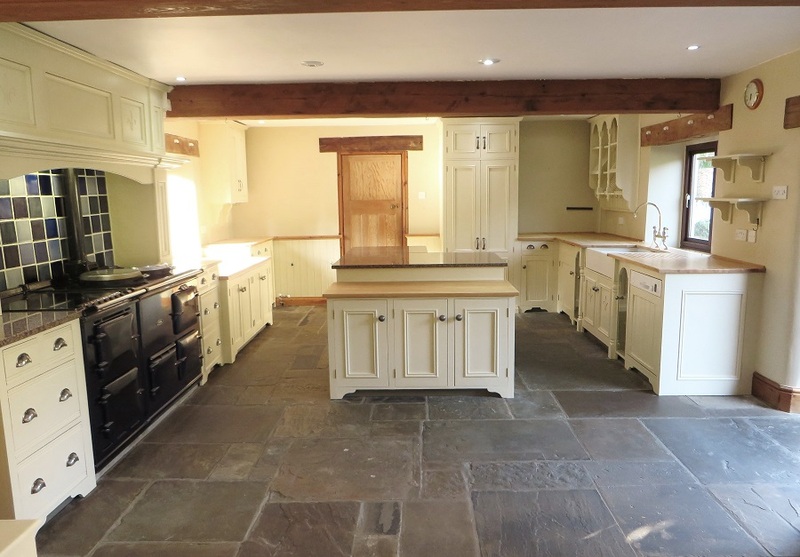 For this hand painted kitchen I travelled to the lovely Thorpe Audlin near Pontefract. 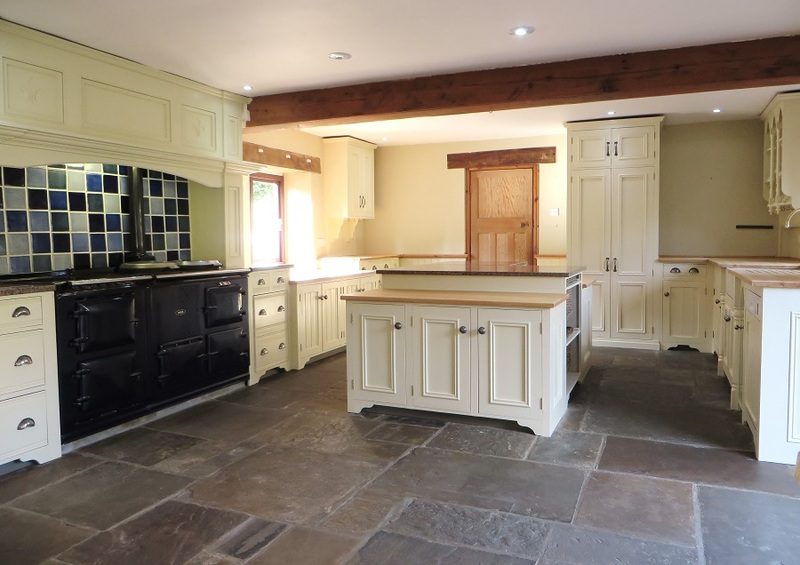 The house was a converted barn and dovecot and had oodles of fabulous original features and character. 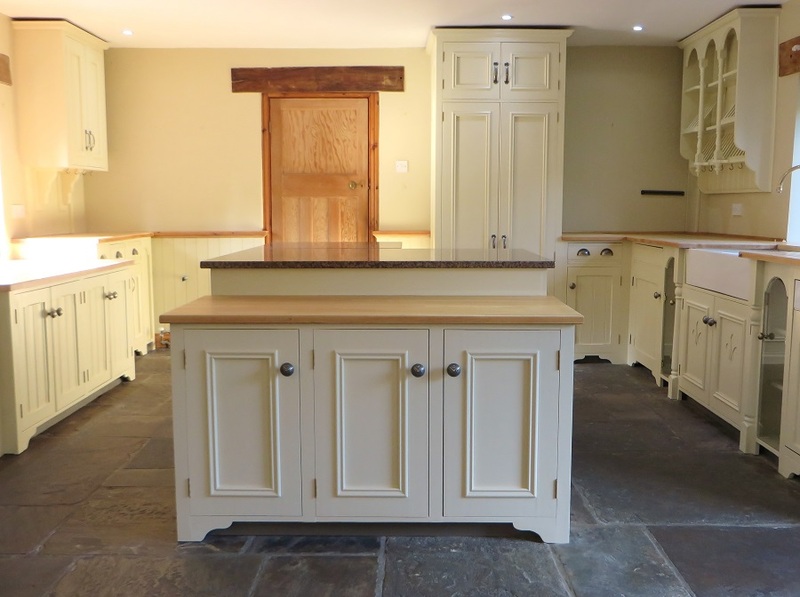 The kitchen had originally been hand made and installed around 20 years ago and the the clients were now looking to bring things a bit more up to date. They contacted me, asking if I could hand paint their kitchen in a light ‘off white’ shade to make it look more contemporary and give the room a lighter, brighter feel. 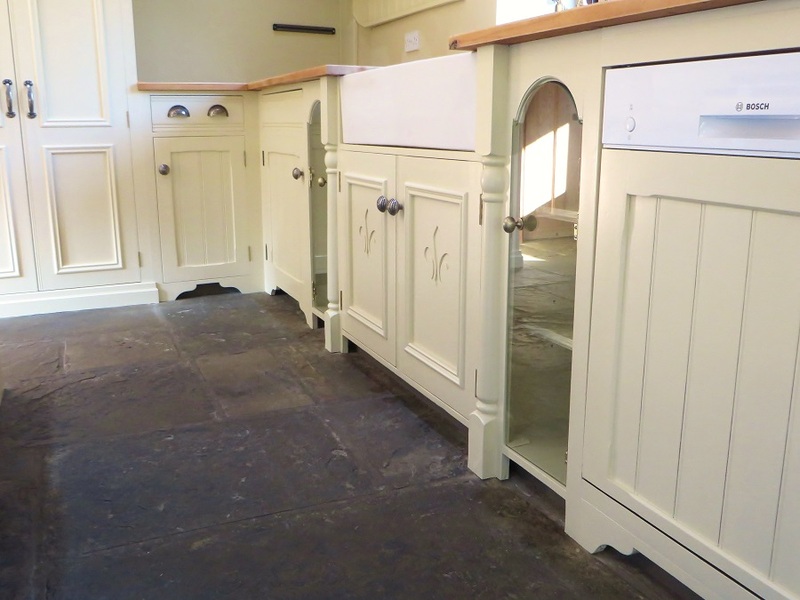 Certain areas were also looking a little worn and tired, so hand painting offered the perfect solution – new look kitchen with a top class finish and all at a fraction of the cost of having it ripped out and replaced, win win! The kitchen had originally been designed so that each stretch of units was at a different height. Doing this meant that each section looks as if it is freestanding, a really nice design touch. The colour chosen was Farrow & Ball’s ‘Matchstick’ which I had Holmans Paints perfectly mix for me in an equivalent shade. The main paints I used were Otex and Empire by Tikkurilla – Otex for the primer and Empire for the top coats. Both are exceptional products and for me, being an ‘oil man’, simply the best kitchen/furniture paints on the market. 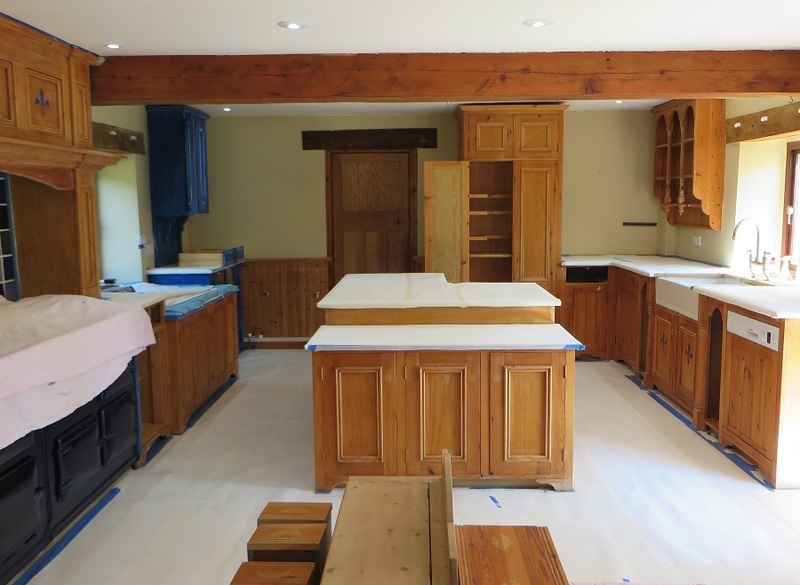 As with any kitchen project, preparation and planning are an integral part of a successful project. 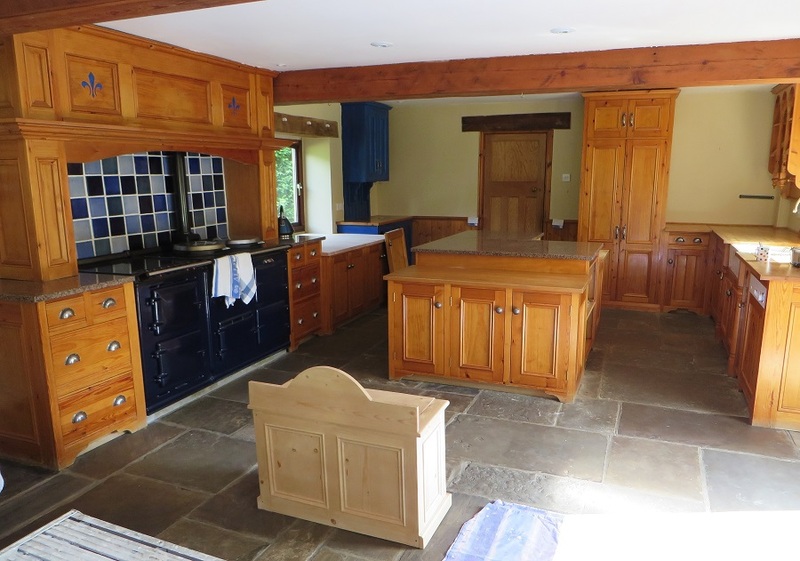 After cleaning I always mask off large areas of the kitchen, including the floor and worktops. This ensures there is no paint anywhere it shouldn’t be and allows me to easily hoover up any dust or fluff. Continually moving dust sheets about releases dust into the air which then sticks to the paint and ruins the finish. Once the units had been cleaned and sanded it was time to spot prime the knots. With the kitchen having been installed 2o years ago the pine was well seasoned and it was unlikely that there would be any sap seepage from the knots. That said, if there was any sap still around and it wasn’t treated then in a six months or a year it would start to come through the paint and eventually ruin the finish. As a precaution I spot primed every knot with Zinnser B-I -N stain blocker, knot sealer and shellac primer. A great multipurpose product that dries within an hour. 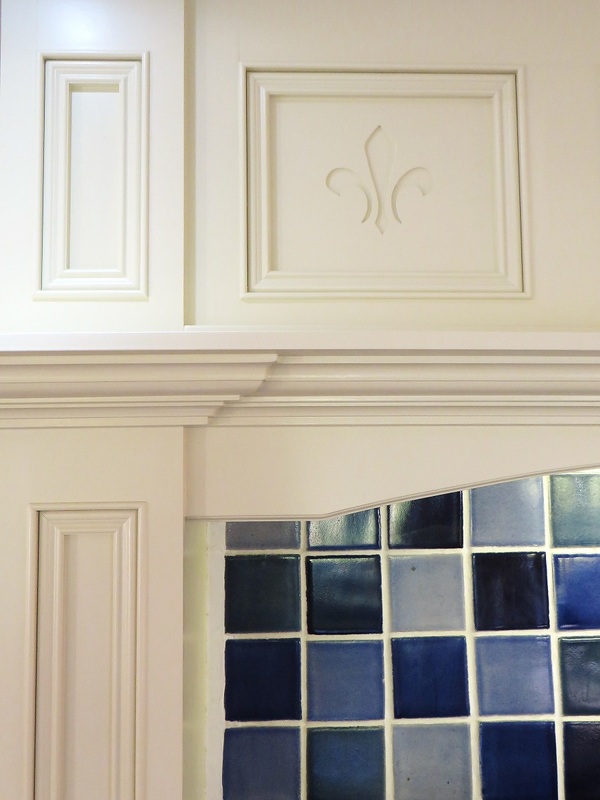 In past Blogs I have gone into a lot more detail about the process and products I use when hand painting a kitchen. If you would like to learn more or see more case studies then please visit my BLOGS page. 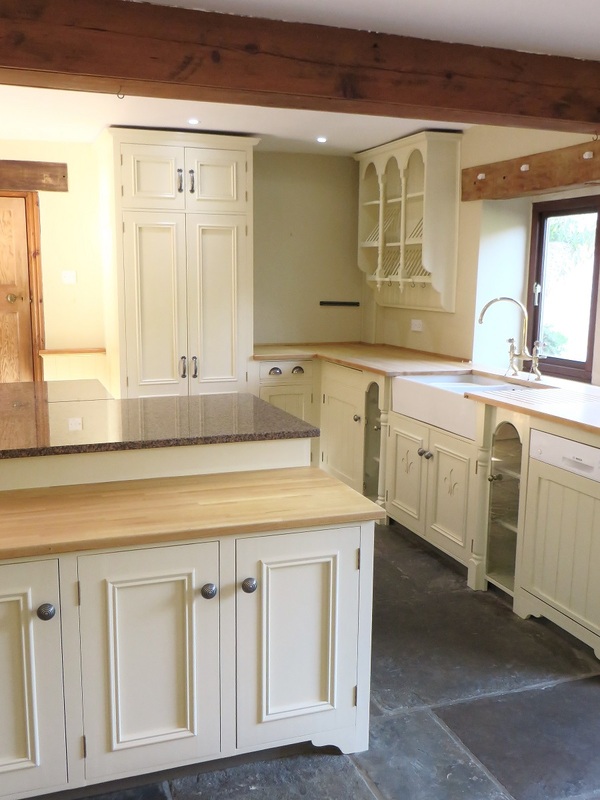 With this kitchen there were a couple of areas that had some intricate twiddly bits. On one side of the island were a set of these latticed doors. 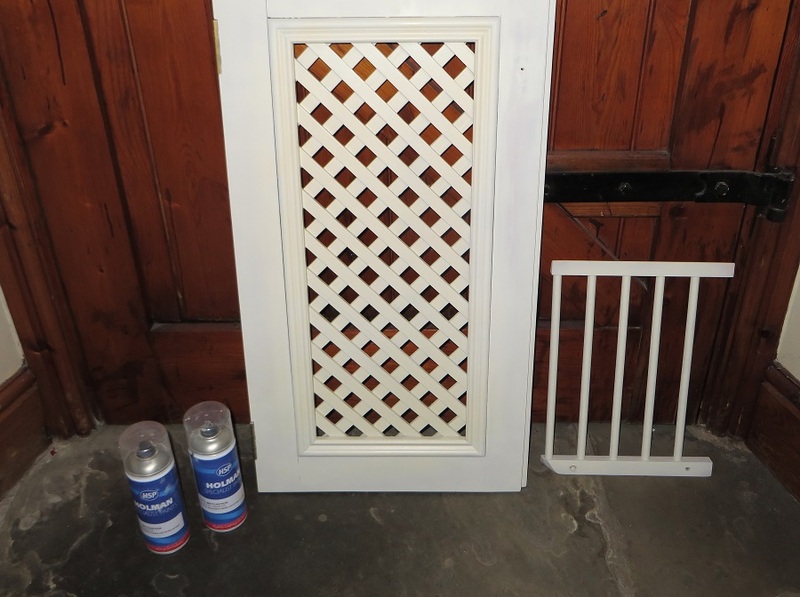 Lattice doors are incredibly time consuming to paint well so I now spray them using an aerosol form of my primer and top coat – Otex and Empire. The aerosols are ‘made up’ by Holmans Paints and are a great solution for fiendishly finickety areas. I also sprayed the plate racks, a much quicker and more efficient solution in this particular instance. As I mentioned earlier, the kitchen had originally been designed so that each stretch of units was at a different height. This meant that each section looks as if it is a freestanding piece of furniture – a really nice and unusual touch. The shaped bases and the recessed kick boards really helped with the illusion so I had the idea of painting the kickboards in a darker colour to further emphasise the fronts. 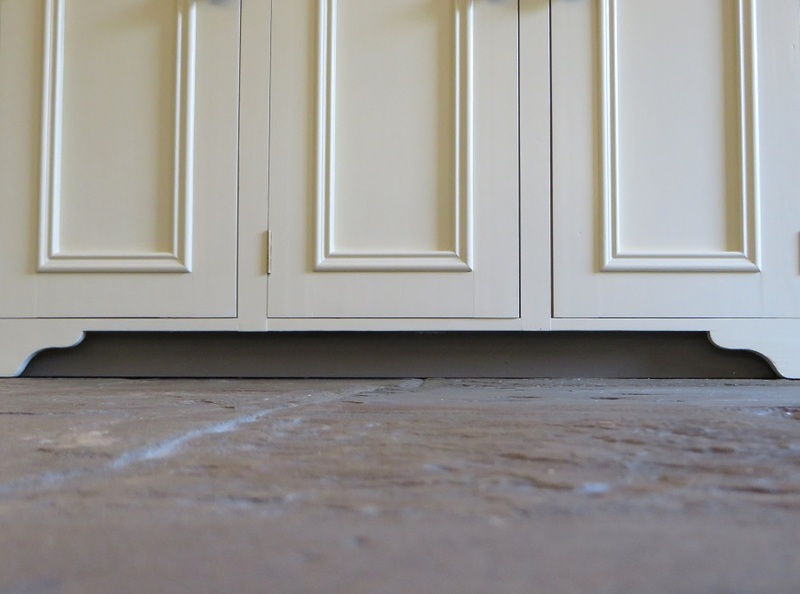 I painted them a lovely warm grey/brown colour to match the floor and they all but blend into the background, heightening the curved base of the units and making them appear completely free standing and almost floating. 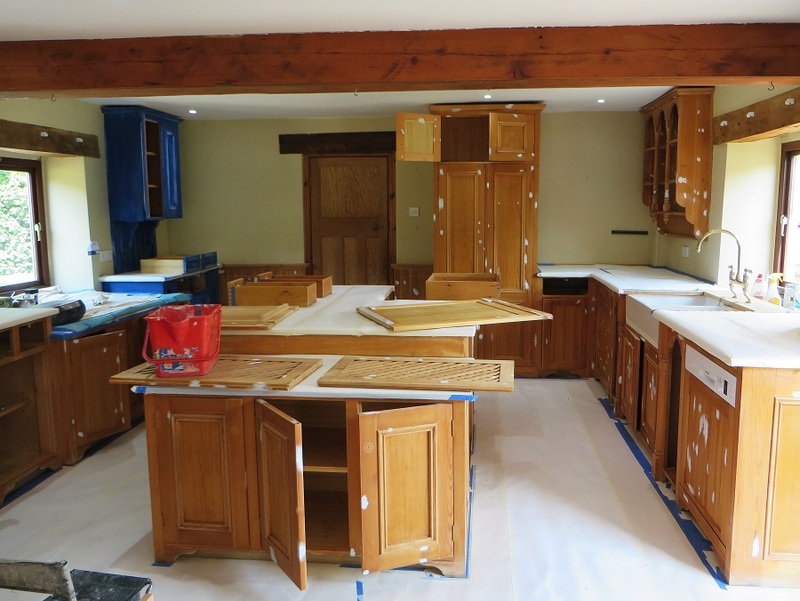 Another really important part of this project was refurbishing the work surfaces. Over the years they had become bleached, scratched and very worn in places. When refurbishing wooden tops it’s very important to first give them a good clean. For my cleaner/degreaser I used my trusty favourite * Krudcutter Original. Once cleaned I power sanded every inch using my electric Festool RTS 400 Q-Plus GB 240V Orbital Sander and Festools Brilliance2 120 grit sanding pads. I then applied three coats of the fabulous Ronseal Contractor ‘Quick Cure’. A product that was recommended to me by Paul at Holmans Paints and is definitely a winner. It says ‘for floors’ on the bottle but works on work tops too, offering a scratch and water resistant coating. It’s easy to apply, levels well, dries quickly and comes in matt, satin or gloss, ideal! 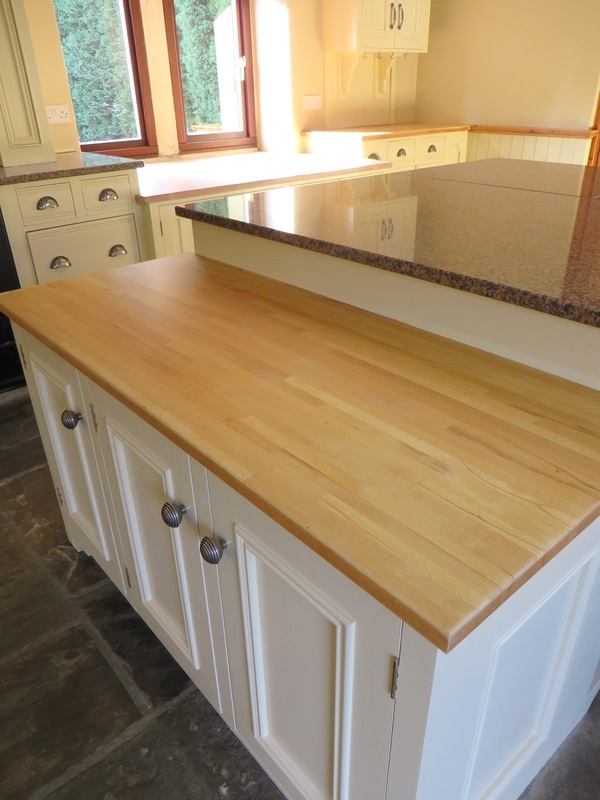 I used the Matt finish and they all came up a treat, bringing back the natural colour of the wood and creating a tough, durable surface that will last for many years to come. 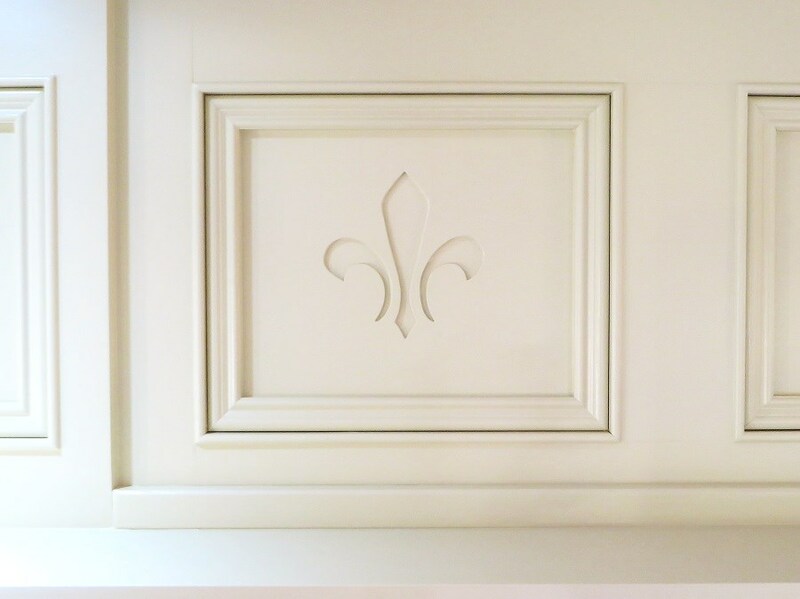 Whilst I was priming everything, I noticed that the gaps around the panels were all perfectly even, a testament to the skill of the cabinet maker who made the kitchen. Normally I fill/caulk any gaps or cracks to create a flawless finish but in this case the cabinetry work was that good that I left these gaps. Leaving them created a lovely bit of detailing that made the panels stand out even more. Sometimes ideas and solutions evolve as the project unfolds. Being able to spot them and offer something unique and special to make things look even better is a skill every Traditional Painter has, and is one of the things that sets us apart and puts us at the top of out game. I really enjoyed this project, not only because of the lovely and appreciative clients but also because but it was such a huge transformation. Going from orange pine to a beautiful ‘off white’ changed the entire feel of the room, adding light, space and creating a real touch of style. Happy Bunny! I received this lovely review from my clients soon after completion, they were obviously very happy bunnies too! ‘We can do nothing but praise Lee for all aspects of his work. From the beginning, when advising on colour for our kitchen, he proved to be both sensitive in taking on board our own personal taste and thought provoking in suggesting ideas we hadn’t thought of. His pride in his work was also obvious from the start: his painstaking approach to choosing the exact right colour for both the walls and the units in a room where the light changes constantly was extremely reassuring, as was his reliability in getting back to us when he said he would. Lee’s consummate professionalism was obvious from the start. Nothing was too much trouble; his attention to detail, even in the preparation of the surfaces to be painted was exceptional. Lee is not a fast worker and this is definitely a compliment to him: when you realise the hours he puts into a job and the determination he puts into solving issues which arise as he gets into the project, it soon becomes apparent that engaging him represents very good value for money. Our project took several weeks to complete and we can honestly say that it was a pleasure to have Lee in the house and, when we were away, we had absolute confidence that he would look after things for us.